How often do you stop and think about the foods you put on your plate? Where are they from, and how have they been grown? Most of us simply wander into our supermarkets in a semi-daze (we get it, especially when there are kids around! ), tossing produce into our trolley, without actually wondering where they've come from or how they have been treated. 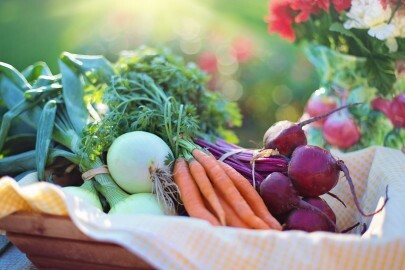 The thing is, once we start to make healthier, more informed choices with our foods (organic means free from chemicals, and higher living standards for animals, while some studies even suggest they might be higher in vitamins and minerals), we can have a say in a healthier, happier world. By enjoying just a few organic foods, you can help to make a difference – and enjoy a healthier lifestyle, too. When you wander into the supermarket, it can feel overwhelming when you’re greeted with the rows upon rows of produce. Which ones should you buy organic? Should all your fruit and veg be organic? It can rack up a fairly hefty bill when you buy only organic produce, so instead aim to buy the so-called ‘dirty dozen’ organically. These are the foods that are ‘dirtier’ and treated with pesticides if not bought organically, and include apples, spinach and strawberries. The not-so-dirty dozen (AKA the ‘Clean 15’) are fine to buy without being organic, and include avocados, aubergine and mangoes. Organic meat can be eye-wateringly pricey, yet it is worth going the extra mile when you can. Non-organic meat is often pumped full of steroids (this is why non-organic chicken breasts are often much larger) and antibiotics, while living conditions are usually poor. If you can’t afford to buy organic meat, then make the most of pulses, or try to make at least one day meat-free! Chickpeas, lentils and beans are a fantastic way of enjoying plant-based proteins without hurting the bank. They’re also full of fibre, too! If living without meat really isn’t an option for you, then buy one or two pieces of good quality, organic meat and make the most of it! We like to buy large, organic chickens and use them for the rest of the week – think a roast one day, perhaps a curry or stew the next, or even a delicious, comforting soup with chicken stock boiled from the bones. One of the best ways to keep healthy on a budget is to eat the rainbow within season. This means avoiding strawberries during December – however tempting they may be! - and, instead, making the most of what’s on offer. If you really want to go the extra organic mile, then why not try growing your own? To enjoy truly organic produce, buy local and support farmers! Most towns or cities, and even villages, will have a farmers’ market, which will be packed full of fresh, organic produce. Many farms will even offer veg and fruit boxes for the week ahead, so go ahead and hunt out those bargains!